which can be rearranged to give Equation (3.59). Hence, we conclude that application of the Young-Laplace equation does indeed lead to a bubble shape that minimizes the net free energy of the soap/air interfaces. where is a constant. 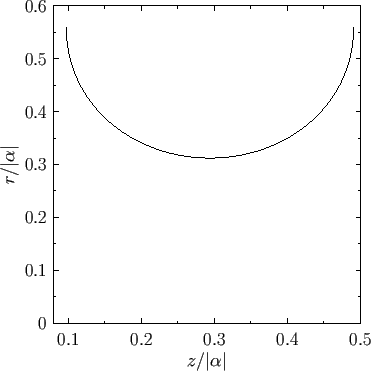 This expression describes an axisymmetric surface known as a catenoid. 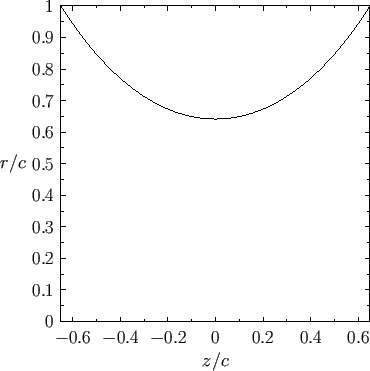 Figure: Radius versus axial distance for a catenoid soap bubble supported by two parallel co-axial rings of radius located at . 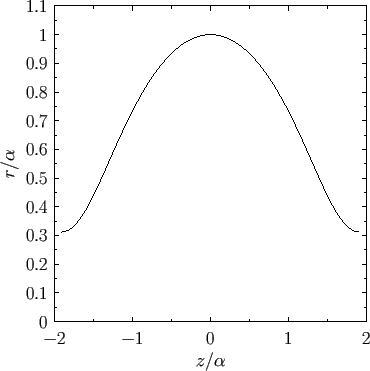 For example, if then , and the resulting bubble shape is illustrated in Figure 3.7.
when . Moreover, if then Equation (3.72) possesses two roots. It turns out that the root associated with the smaller value of minimizes the interface system energy, whereas the other root maximizes the free energy. Hence, the former root corresponds to a stable equilibrium state, whereas the latter corresponds to an unstable equilibrium state. On the other hand, if then Equation (3.72) possesses no roots, implying the absence of any equilibrium state. The critical case corresponds to and , where and . It is easily demonstrated that and . We conclude that a stable equilibrium state of a catenoid bubble only exists when , which corresponds to . If the relative ring spacing exceeds the critical value then the bubble presumably bursts. 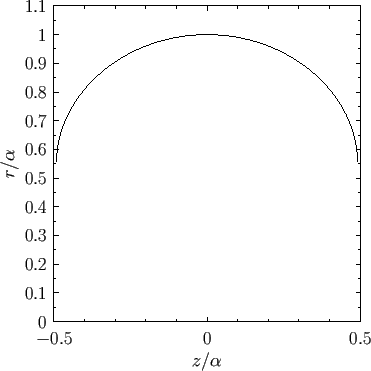 Figure: Radius versus axial distance for an unduloid soap bubble calculated with . where and are incomplete elliptic integrals [see Equations (3.40) and (3.41)]. Here, we have assumed that when . There are three cases of interest. Figure: Radius versus axial distance for a positive pressure nodoid soap bubble calculated with . The axisymmetric curve parameterized by the previous pair of equations is known as an nodoid. This particular type of nodoid bubble has positive internal pressure: that is, . An example positive pressure nodoid soap bubble is illustrated in Figure 3.9. The axisymmetric curve parameterized by the previous pair of equations is again a nodoid. However, this particular type of nodoid bubble has negative internal pressure: that is, . An example negative pressure nodoid soap bubble is illustrated in Figure 3.10. Figure: Radius versus axial distance for a negative pressure nodoid soap bubble calculated with .